The Santa Fe Trail got it's name from it's destination...Santa Fe, New Mexico. It was used largely between 1821 and 1880. The trail passed through what is now Kansas, Colorado, and New Mexico. It took about two weeks for travellers to go from one end of the trail to the other. The trail had two forks: The Mountain Fork which went through Colorado and the Cimarron Fork which went through Kansas. 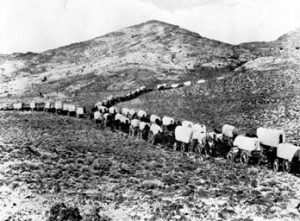 Those who took the Cimarron Fork route settled in Kansas in large numbers. The population there went from about 8,600 in 1855 to 143,000 by the time Kansas became a state in 1861! William Becknell was a trader who set out from Franklin, Missouri with a wagon load of stuff for selling. 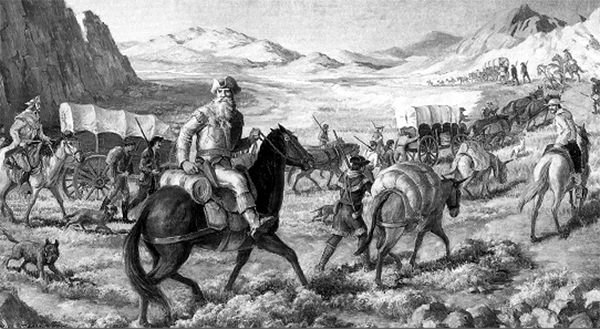 Inspired by the success of the McKnight and Beard Party before, Becknell traveled more than 900 miles (1,400 km) through hot and hostile lands to trade with the Natives for furs. On this trip, he ran into Beard's returning party and heard of their success in Santa Fe and decided to follow their example. After Becknell blazed the trail, others followed his example and over time, traffic escalated quickly. Becknell attempted a second trip to try and find a shorter route to Santa Fe. It was a fatal mistake...the party found themselves in a sandy desert with no water supply and they wandered around for several days in misery...they killed their dogs and even cut off the ears of their mules to try and curb their thirst with the animals blood. Several of the men died and the few remaining pushed on trying to survive. They would have died had they not found a buffalo that they shot for it's blood and luckily, they also found water in its stomach. This saved their lives...they were able to follow it's tracks to a creek at which it had just been drinking. During the Mexican-American War, Americans forces actually used Becknell's trail as an invasion route! At one time, there was as many as 4,000 people who were trading through Santa Fe and a lot of money was being made. The Santa Fe Trail, like most trails at this time, had dangers that it presented to travelers on it. This trail passed through areas populated by the Apache and Commanche tribes who were not pleased with the emmigrants passing through their lands. They also ran into Mexican's passing through the high plains. These posed enough of a threat that the US Military set up a series of forts along the trail to protect travellers. Another difficulty faced by travellers on the trail was finding water. There were fewer opportunities for people to take shelter from sudden, fierce wind or rainstorms. Rattlesnakes were more common and a bite on trail could be deadly. Ultimately, the Santa Fe trail was replaced by the Atchison, Topeka, and Santa Fe Railway.